Banana Island Resort Doha by Anantara and Souq Waqif Boutique Hotels by Tivoli, managed by Minor Hotels Group, bagged four prestigious awards during the Fact Dining Awards Doha 2018. This significant award ceremony is held annually to honour leading food & beverage outlets in town, where awards are distributed in 34 categories in the presence of more than 400 guests. Banana Island Resort Doha by Anantara’s team received the “Best Al Fresco Restaurant in Doha 2018” award for its Q Lounge & Restaurant and the “Best Middle Eastern Restaurant in Doha 2018” for its AL Nahham restaurant. Both these awards were based on the jurors’ decision. While Souq Waqif Boutique Hotels by Tivoli’s team received the “Best Morrocan Restaurant in Doha 2018” award based on the Jurors’ selection and the “Favourite Al Fresco Dining Restaurant in Doha 2018” for Al Terrace Lebanese restaurant based on the readers’ choice. Al Nahham restaurant at the Banana Island Resort offers a wide variety of Arabic and Mediterranean delicacies through a unique combination of tastings and flavours that make dining at the restaurant an exceptional experience in a unique ambience that blends contemporary Arabian style with stunning view overlooking the Arabian Gulf. Q Lounge & Restaurant is considered as the permanent sanctuary for all guests and visitors of the resort providing tranquillity and comfort away from the city’s noisy & stressful life. The boutique restaurant offers a rich menu including breakfast, lunch by the pool as well as international dishes such as tapas and Canapé during the evening. At Souq Waqif Boutique Hotels by Tivoli, Argan Restaurant is set in bright colours and elegant surroundings, which reflect its distinctive décor. A variety of rich Moroccan cuisine is prepared in a traditional way, allowing Moroccan food aficionados to enjoy a wonderful taste with unique flavours and distinct cooking style. “Al Terrace” Lebanese restaurant with its interior and exterior lounges and Terrace overlooking the Souq, offers a variety of Arabic and international cuisines that guests can relish while indulging in live entertainment. 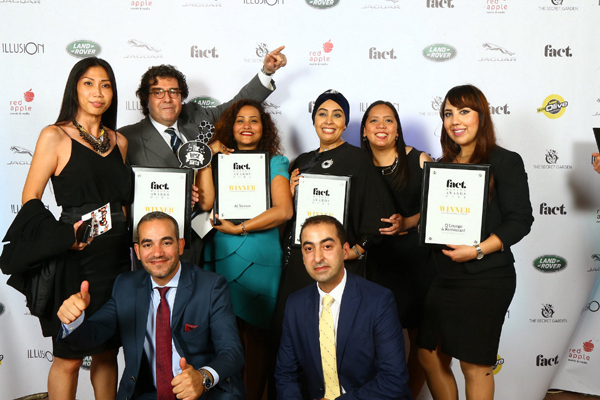 Elated with the big win, Thomas Fehlbier, area general manager - Qatar of Minor Hotels Group, owners of Anantara and Tivoli brands and the operators of both the Banana Island Resort and Souq Waqif Boutique Hotels said: “We are honoured to have received four awards during the Fact Dining Awards Doha 2018 ceremony, which reflect the high quality and global standards adopted by Banana Island Resort by Anantara and Souq Waqif Boutique Hotels by Tivoli in Qatar. Our focus has always been to provide the highest levels of services and offer our customers unforgettable experiences while visiting us.